MINERAL WELLS, TX (October 18, 2012) – Cool City Electronics, Inc., dba Cool City Avionics, a manufacturer of low cost, professional-grade automatic flight guidance control systems and helicopter stability augmentation systems, is pleased to announce that it has appointed thirteen new authorized dealers in the United States, three in Canada and one each in Denmark, Germany and Guatemala. Additional dealers will be appointed in the coming months. The new dealers in the U. S. include Merrill Field Instruments in Anchorage, AK, Vista Aviation in Pacoima, CA, Rotorcraft Support in Van Nuys, CA, Palm Beach Avionics in West Palm Beach, FL, The Flightstar Corporation in Savoy, IL, Bevan-Rabell in Wichita, KS, Avionics Solutions inAbbeville, LA, JPS Aviation in Monroe, LA, Contact Aviation Services in Waterford, MI, Spirit Avionics in Columbus, OH, Hillsboro Aviation in Hillsboro, OR, Wysong Enterprises in Blountville, TN, and Uniflight, LLC, in Grand Prairie, TX. In Canada, the new dealers include ASAP Avionics Services in Cambell River, BC, Vector Aerospace in Langley, BC, and Kitchener Aero Avionics in Breslau, ON. In Europe, the new dealers are Scandinavian Avionics in Billund, Denmark, and Avionik Straubing in Atting, Germany. In Guatemala, the new dealer is Electroniks in Guatemala City. The new dealers will be authorized to offer their customers the full line of Cool City Avionics flight controls, including the SAS-100 Stability Augmentation System, recently FAA-approved for installation in the Robinson R-44, the FT-100 Force Trim System and the SFT-100 SASPlus, a combination of the SAS-100 and FT-100. In the first quarter of 2013, they will also be able to offer the company’s new family of autopilots for helicopters and airplanes. “Each of the dealers in this initial group were carefully selected for their excellent reputations for quality, reliability and customer service, in addition to being well respected by their peers and customers,” said Jim Irwin, President/CEO. 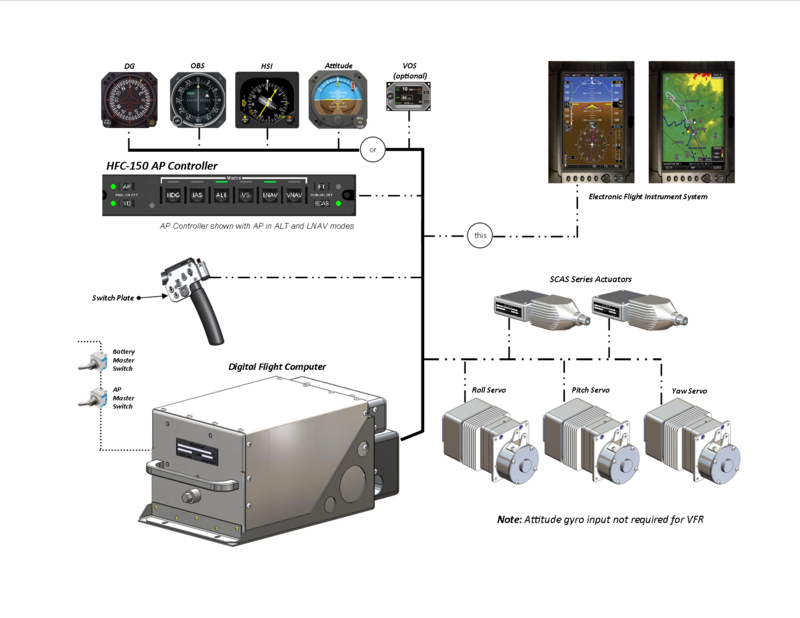 Information about the full line of flight control systems is now available on the company website at: www.CoolCityAvionics.com/products/. Cool City Avionics has been developing and flight testing its new family of light weight, full function, professional-grade stability augmentation systems and autopilots for helicopters since 2004. The company is in the final stages of FAA certification of four Automatic Flight Guidance Control Systems for helicopters. EASA approval will be initiated immediately following the FAA approval. The company’s digital flight guidance control systems for airplanes are in development with planned availability in 2013. Cool City Avionics develops and manufactures modern, innovative automatic flight guidance control systems for General Aviation helicopters and airplanes. The management team and support staff have more than 400 years of combined experience in the design, development and manufacture of a variety of flight control products, many of which still retain a majority market share after more than 25 years. For more information about the company and its products, please visit www.CoolCityAvionics.com or contact Wayne Sanderson, Executive Vice President, at 940-327-8400 or email to: wsanderson@coolcityavionics.com. The Cool City Stability Augmentation System (SAS) is designed for light to medium sized helicopters to improve basic airframe stability and reduce the upsets encountered in turbulence. Consisting of an analog computer, with internal solid-state rate sensors, two series actuators (pitch/roll), and an annunciator/switch; the SAS system works by detecting and counteracting high-rate perturbations. The series actuators, installed in the rotorcraft’s primary control tubes, are very high-rate, low authority, electromechanical actuators. The actuators operate with approximately 10% control travel authority and take less than a second to move full actuator travel. For unquestioned safety, the actuators have internal electrical and mechanical stops. Unlike other systems on the market that use parallel servos for SAS functions, the Cool City SAS-100 system incorporates series actuators for SAS operation. The use of series actuators in the system is important because it results in the operation of the SAS being transparent to the pilot and does not provide adverse feedback into the cyclic stick that would be detrimental to the training environment. Operation of the Cool City SAS System is approved throughout the full flight envelope, from start-up to shut-down. The SAS System improves rotorcraft safety by reducing pilot workload and fatigue, while improving the quality of ride for all occupants. With Cool City’s building block philosophy, you may later add the two or three axis digital helicopter autopilot to complete your rotorcraft’s automatic flight control system; and…without a substantial loss of your initial investment. Contact your nearest Cool City Avionics dealer to discuss how the SAS-100 can improve your flight environment. The Cool City Force Trim System is designed to give the pilots of light to medium-sized helicopters some “hands free” time to perform other activities, or just relax for a bit. The system holds the cyclic in its position at the time the system was activated by pressing a switch on the cyclic. It also reduces the pilot’s stress and fatigue, by giving him a few minutes of relaxation time. Once activated, the system holds the cyclic in place using a force gradient system that provides a “force feel” as the control is moved away from its center “engage” position. he system is light weight, less than 5 lbs. installed, and is upgradeable to most of our other products, including our full-function, 3-axis Autopilot/SCAS system, the HFC-150. The FT-100 is engaged and disengaged by using a switch mounted on the instrument panel. It can also be interrupted, by use of a convenient “Trim Release” switch mounted on the cyclic grip, for short-term maneuvering or re-centering. The SAS provides roll and pitch stabilization that improves the handling qualities of the helicopter, while being transparent to the pilot. It increases basic aircraft stability by opposing low-amplitude upsets from any cause. With the SFT-100 installed, the SAS function will reduce the amplitude of any turbulence upset and eliminate many of the smaller motions or disturbances. Most of the small upsets to the aircraft are not detected by the pilot, thus requiring no effort to react to them. 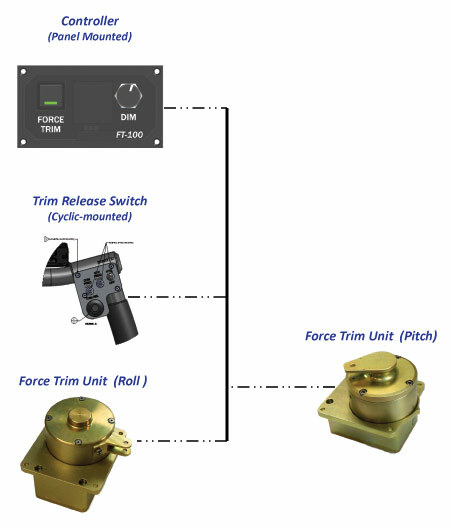 The Force Trim function gives the pilot an “extra hand” that holds the cyclic in place using a Force Gradient system that provides a “force feel” as the control is moved away from its center “engage” position. The unique SAS+FT combination gives the pilot hands-free operation for short periods to perform other “housekeeping” activities, often without significant heading or altitude drift. The SAS and Force Trim functions are engaged and disengaged by using a pair of switches in the panel-mounted controller. The FT function can also be interrupted by use of a convenient “Trim Release” switch mounted on the cyclic grip for short-term maneuvering or re-centering. The SAS is FAA-approved for full-time operation throughout the flight envelope ….. from take-off to landing. System weight is less than 13 pounds, installed. The Cool City HAP-100 Helicopter Autopilot System is a two-axis (roll/pitch) rate/attitude based AP. The HAP-100 brings unparalleled performance and safety to light and medium-sized rotorcraft at a fraction of the cost of systems that were designed many years ago. The HAP-100 provides a two-axis rate/attitude-based autopilot system, increasing the pilot’s ability to handle the workload extremes of the rotorcraft cockpit environment. Available modes of the HAP-100 include: HDG (heading mode), IAS (indicated airspeed), ALT (altitude hold), VS (vertical speed), LNAV (lateral navigation), and VNAV (vertical navigation). In addition, an autopilot failure will still leave the pilot with the option of Force Trim mode to hold the cyclic in the position of engagement; therefore, the pilot still has the ability to remove his hands from the cyclic for a short period for other duties without the worry of the helicopter deviating from the intended path. 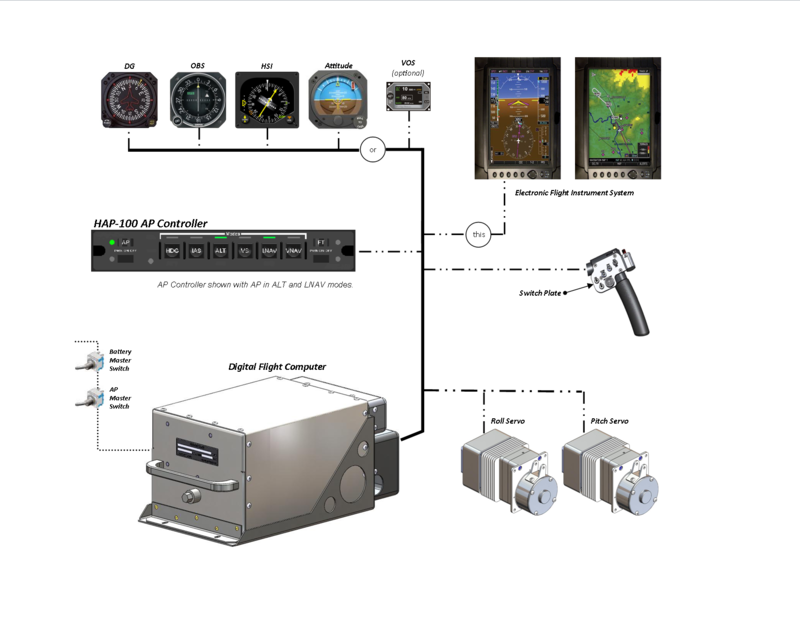 As designed, the Cool City HAP-100 will interface with essentially all models of installed attitude gyros, electronic flight instrument systems, and/or air data systems with outputs for the digital flight control system. To learn about these, and other exciting attributes of the HAP-100, contact your nearest dealer. MINERAL WELLS, TX (September 7, 2012) – Cool City Electronics, Inc., dba Cool City Avionics, a manufacturer of low cost, professional-grade automatic flight control systems and stability augmentation systems for helicopters, is pleased to announce that it has received FAA Supplemental Type Certificate SR09624RC for its SAS-100 Stability Augmentation System, allowing its installation in Robinson R-44 helicopters. The new Stability Augmentation System (SAS) improves aircraft dynamic stability in response to turbulence upsets while hovering and in flight. A SAS will typically remove upsets requiring less than 10% cyclic motion and will reduce the amplitude of larger upsets, thus requiring smaller pilot cyclic corrective inputs. The results are easier, and more accurate, hovering in turbulence and a more comfortable ride in cruise with fewer control inputs required by the pilot. 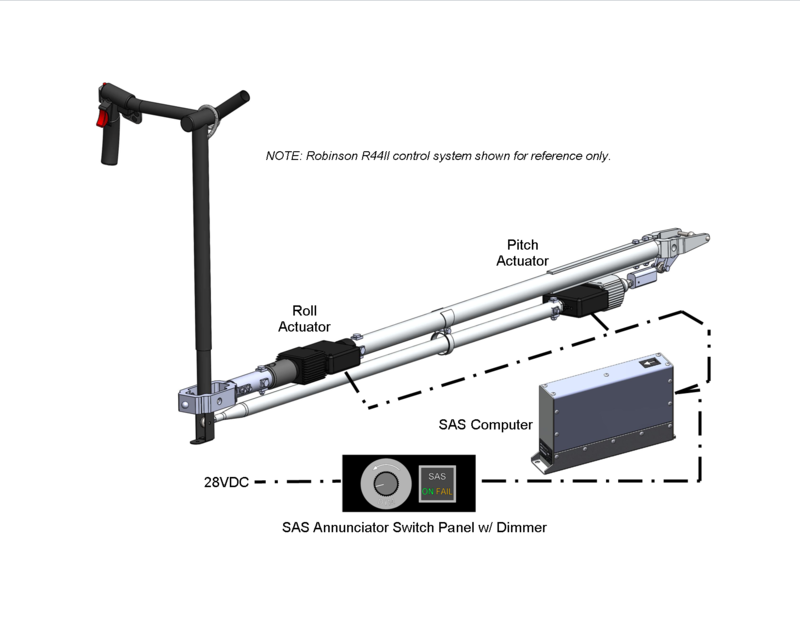 The SAS uses roll and pitch actuators in series with the pilot and is transparent in operation. The SAS uses integral solid state gyros for high reliability and typically weighs less that 10 lbs. installed. The low introductory price of the SAS, at $17,995, plus installation kit and installation, makes it affordable for many small helicopters. As a result of the “building block” system design, when the aircraft is later upgraded to a full SCAS/Autopilot system, the majority of the SAS purchase price is deducted from the SCAS/Autopilot system price, so very little of the SAS investment is lost in the upgrade conversion. Cool City Avionics has been developing and flight testing its new family of light weight, full function, professional-grade stability augmentation systems and autopilots for helicopters since late 2004. Cool City is now in the final stages of FAA certification of its Automatic Flight Guidance Control System for helicopters. Cool City digital flight control systems for airplanes are now in development with planned availability in 2013. Cool City Avionics develops and manufactures modern, innovative automatic flight guidance control systems for General Aviation helicopters. The management team has more than 400 years of experience in the design, development and manufacture of AFGCS products, many of which still retain a majority market share after more than 25 years. For more information about the company and its products, please visit: www.CoolCityAvionics.com. MINERAL WELLS, TX (September 23, 2011) – Cool City Electronics, Inc., dba Cool City Avionics, the leading manufacturer of low cost automatic flight control systems and stability augmentation systems for helicopters, is pleased to announce that it has completed its move to larger quarters at 6300 Columbia Street, Mineral Wells, TX 76067. Located on the Mineral Wells Municipal Airport, the 61,000 sq. ft. facility houses the company headquarters and the engineering, manufacturing, quality control, certification and flight engineering departments. It includes 24,000 sq. ft. of hangar space and 15,000 sq. ft. of covered ramp, as well as seven acres of fenced ramp. “This move was necessary to accommodate the company’s expanding engineering and manufacturing operations and provide hangar space to work simultaneously on several aircraft of varying sizes, including the largest helicopters in the industry,” stated Jim Irwin, President and CEO. Cool City Avionics has been developing and flight testing its new line of light weight, full function, professional-grade stability augmentation systems and autopilots for helicopters since 2003, and is in the final stages of FAA certification. The Cool City HAP-150 Helicopter Autopilot System is a three-axis (roll/pitch/yaw) rate/attitude based AP. The HAP-150 brings unparalleled performance and safety to light and medium-sized rotorcraft at a fraction of the cost of systems that were designed many years ago. The HAP-150 provides a three-axis rate/attitude based autopilot system, increasing the pilot’s ability to handle the workload extremes of the rotorcraft cockpit environment. Available modes of the HAP-150 include: HDG (heading mode), IAS (indicated airspeed), ALT (altitude hold), VS (vertical speed), LNAV (lateral navigation), and VNAV (vertical navigation). The Yaw Damper engages with the autopilot; however, it may be operated alone or turned off, as the pilot desires. The Yaw Damper function also monitors collective inputs to provide rudder movement to offset collective changes. 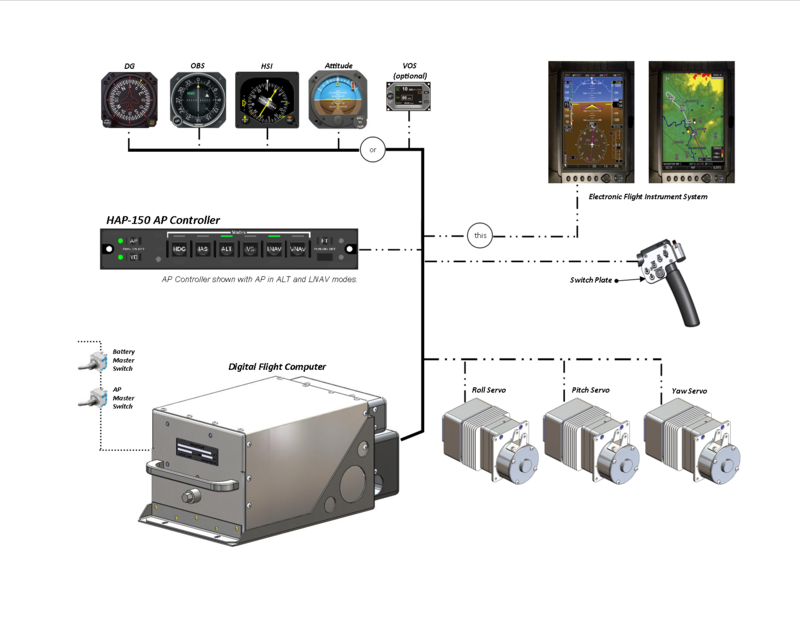 As designed, the Cool City HAP-150 will interface with essentially all models of installed attitude gyros, electronic flight instrument systems, and/or air data systems with outputs for the digital flight control system. To learn about these, and other exciting attributes of the HAP-150, contact your nearest dealer. The Cool City HFC-150 Helicopter Flight Control System is the ultimate in a three-axis autopilot (AP) and two-axis stability control and augmentation systems (SCAS). Consisting of a two-axis (roll/pitch) rate-based SCAS and three-axis (roll/pitch/yaw) rate/attitude based AP, the HFC-150 brings unparalleled performance and safety to light and medium sized rotorcraft at a fraction of the cost of systems that were designed many years ago. Included in the HFC-150, a rate-based Stability Control and Augmentation System improves basic rotorcraft stability and reduces the high-rate perturbations encountered in turbulence. 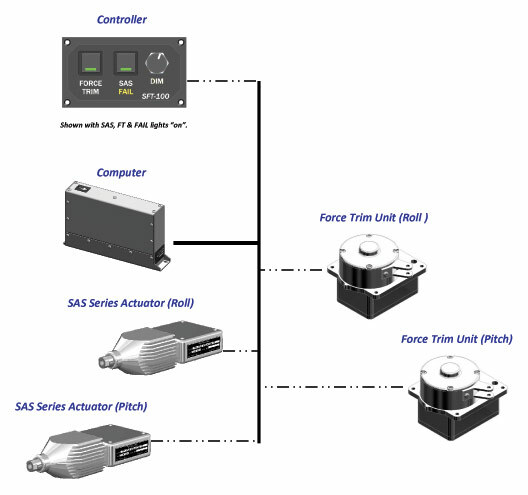 The SCAS series actuators, installed in the rotorcraft’s primary control tubes, are very high-rate, low authority, electromechanical actuators. The actuators operate with approximately 10% control travel authority and take less than a second to move full actuator travel. For unquestioned safety, the actuators have internal electrical and mechanical stops. In addition to the safety and ride-quality improvements of the SCAS, the HFC-150 provides a three-axis rate/attitude based autopilot system, increasing the pilot’s ability to handle the workload extremes of the rotorcraft cockpit environment. Although the SCAS and autopilot electronics are contained within a single box, the two systems are independent. Each has their own power inputs and internal power supplies; with a failure in one system not adversely affecting the remaining system. In addition, an autopilot failure will still leave the pilot with the option of Force Trim mode to hold the cyclic in the position of engagement; therefore, the pilot still has the ability to remove his hands from the cyclic for a short period for other duties without the worry of the helicopter deviating from the intended path. 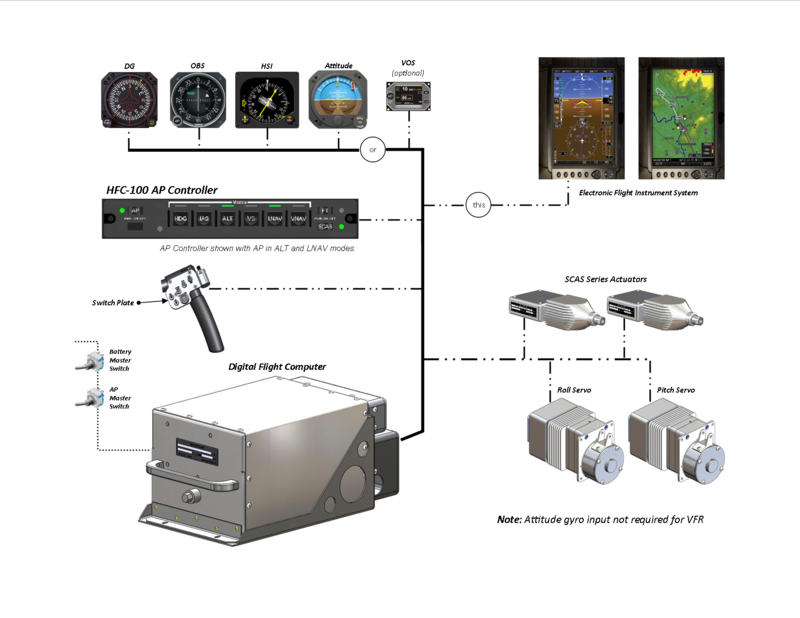 As designed, the Cool City HFC-150 will interface with essentially all models of installed attitude gyros, electronic flight instrument systems, and/or air data systems with outputs for the digital flight control system. To learn about these, and other exciting attributes of the HFC-150, contact your nearest dealer.